A super fantastic, incredibly beautiful, God-sent day. I love Spain! Today’s walk was stunningly gorgeous and a great experience all rolled into one. We started out with a little worry as it looked like there were no rooms to be had in Genevilla when we got there and we had to sort out something including some taxi shuttling. It turned out that this was FAR from a problem but more about that later. We started at 8:40am with a send off and a handshake from our host (not as good as the kisses from the hostess in Araia but…). We could have set off earlier if we had figured out that the first three or four kilometres were so flat but we enjoyed a good long sleep. In San Vincente, we found a bank that was open and they changed one of the silly 200€ notes we had from Singapore. You can’t spend those anywhere in Spain unless you are buying something that costs more than 199€. Unfortunately, that’s all they had when we changed money. The gentle walk through farmland to Oteo was full of lovely scenery and we always had cowbells clanging in the distance to serenade us. As we went down through one forested area, we could see one cow about 50m away in thick brush. Only his bell gave him away but another 30 meters further down the trail, I asked Melanie, “Did you see that?” and she replied “the cow?”. I said “that’s no cow!” as I pointed to the rather impressive looking bull standing just above the trail about five meters away and staring daggers at us. I wasn’t worried though because it was Melanie who had the red rain cover on her backpack and I can outrun her anyway. Oteo almost appeared as a very small abandoned village. The only signs of life appeared to be two dogs barking. We were hoping to get at least some water there but the village fountain had moss growing inside the always flowing tap. It didn’t looking too potable to me. Fortunately we saw a woman coming out of a house and we asked “agua, por favor?” She replied through all five teeth in rapid Basque Spanish something about it not being her house. Did she just rob it? She would not take my empty bottle but she led me into the old home. My first option was to fill the bottle from the dirty hose laying in the bleach bottle but I think she noticed my look of aghast. She then took me to the kitchen and I managed to get some tap water. We chatted the whole time without understanding each other one bit. But I had my water. 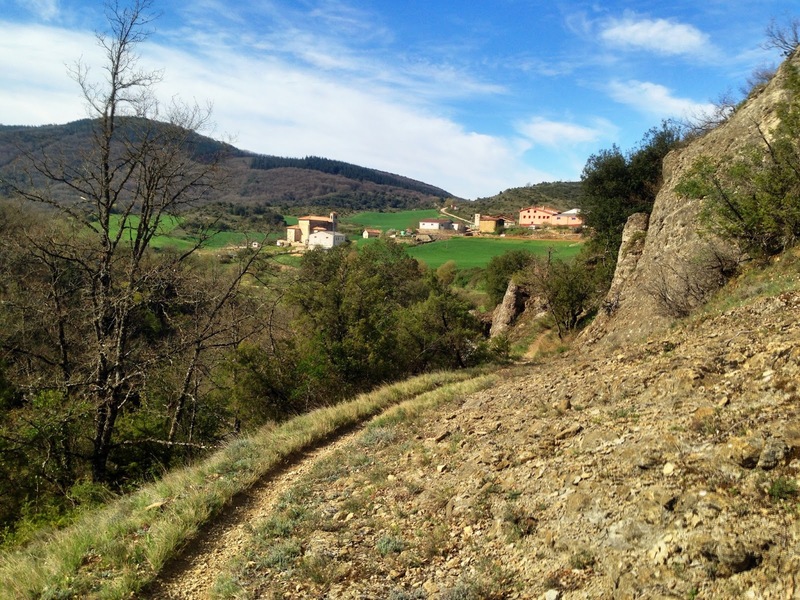 More beautiful scenery and a steep descent took us to Antoñana. It looked like a beautiful village but we hoped to get some lunch as it was about noon. We asked one woman if the town had a restaurant or bar and she replied “for eating?” I confirmed that impressive guess and she replied, “No, much later, around 9:00pm”. Oh well, let’s try the next town. We have been missing lunch on most days but with several villages along today’s path, we had hoped something could be done. Again, we had a lovely stretch of walk, mostly along an abandoned rail line to Santa Cruz de Campezo. The first building we came to in the larger town was a restaurant and bar. Actually, more bar than restaurant as they only served food at night. It didn’t take long though to find a wonderful place on the main square called La Plaza. The very helpful and friendly barman made us a salad and a sandwich that really hit the spot, along with my icy cold beer and Melanie’s piping hot coffee. He tried to help us with accommodations near Santa Cruz but logistically, it was going to be hard to work out. He sent us off with a Buen Camino, a stamp for our credentials and luck on finding something in Genevilla. 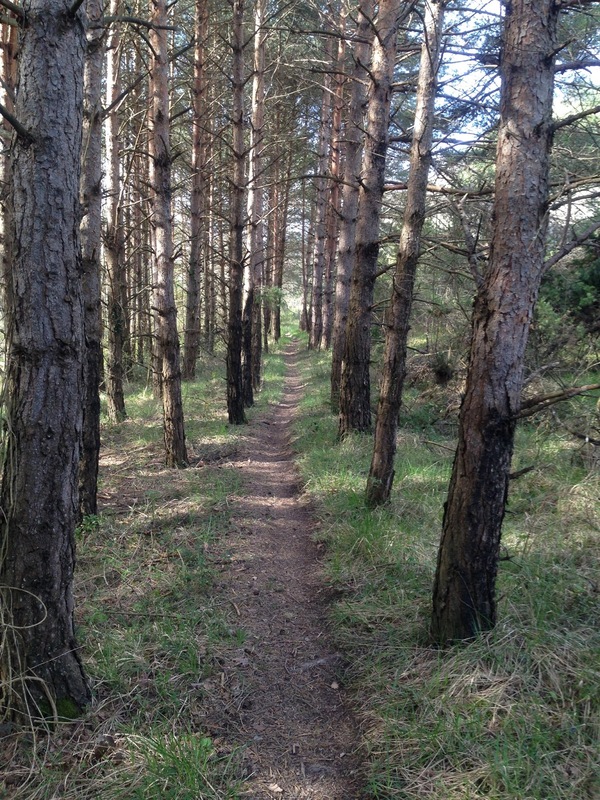 The final stage of today’s walk was easy because of the gentle Forrest path as well as our full stomachs. There was a little mud but it caused very little issues today. Nothing was going to stop us from continuing to have a wonderful day…except maybe no room at the inn. Genevilla has two Casa Rurals, the owner of one of those told me that they were not taking guests today. The other one seemed to be for groups rather than individuals and we didn’t have a phone number for them anyway. As we entered the tiny village, a man came our from the bar (that’s a good sign right there!) and asked us in Spanish if we were pilgrims and we confirmed we were. We asked where the Casa Rurals were and he changed to English. We happened to be leaning up against the side wall of the one that told me they weren’t taking guests tonight. He walked inside and convinced the hostess to take us in. Jesus is our new friend (that’s pronounced “hey Zeus” for all of you who thought I found God). He turned out to be the friend of the owner of Casa Rural Usategieta and the man who renovated the old house into the gorgeous guest home that it is now. This place is fantastic and I highly recommend it. The bedroom is about the size we would expect but tastefully decorated and renovated to keep the spirit of the old house. I actually gasped when I saw the bathroom as it is nicer than anything that you would expect in a guest house. The final physical surprise was the guest’s leisure room downstairs. In the converted animals quarters is a lovely living room with fireplace, a library and a dining room, again all very tastefully decorated and renovated to retain the soul of the house. The hostess told us that there was no restaurant in town and she was not prepared for visitors so dinner was only going to be eggs or something. It turned out to be a lovely meal of chicken with ham in a cream sauce, potatoes, Spanish rice, and an apple raisin dessert. We would have been happy with scrambled eggs so this dinner really bowled us over. We also learned that the owner was involved in setting up an albergue in town. 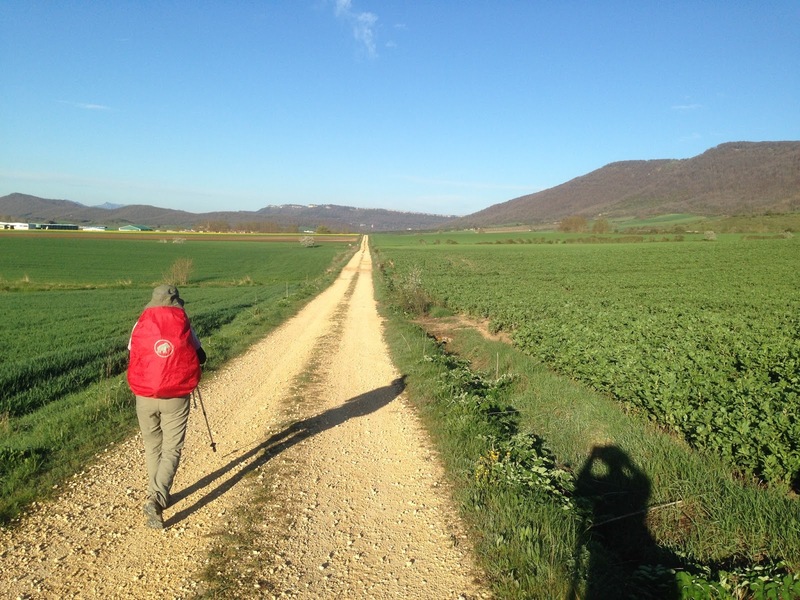 I am not sure how far plans have gone but it should soon be a great addition to this Camino for pilgrims on a budget. 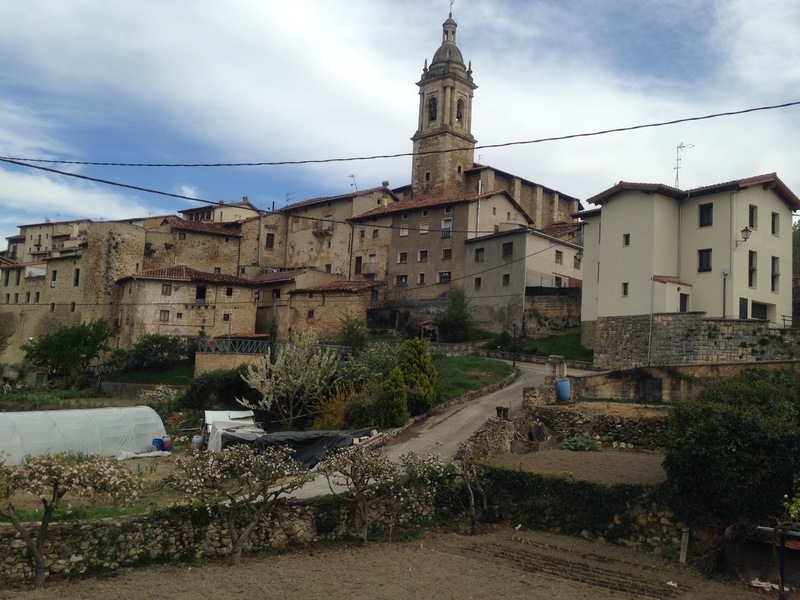 The rooms we’ve had have been in the 35-60€ range and even though that is for two of us, many pilgrims would not want to do this Camino at those prices. In summary for me, I can’t think of much that could have made this day better. Melanie could think of a few things though. Her backpack was giving her a back ache but a few adjustments appeared to have fixed that. Also, she developed some type of blister on top of her foot. She says it was painful but only when she is walking. We shall aim to fix that tomorrow too. This walk should be enjoyable for both of us. For those following us: PLEASE DO! You will love it. 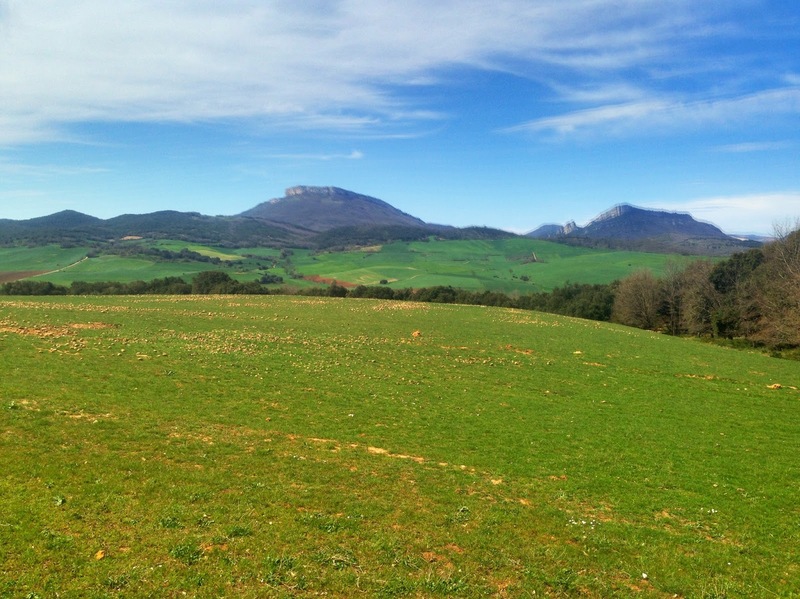 The Basque people and countryside have both been wonderful. 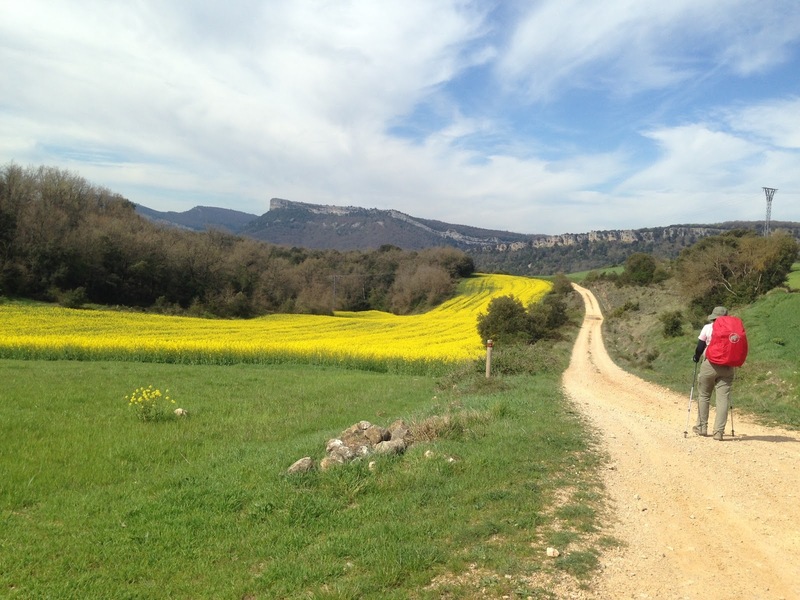 This Camino needs pilgrims to get the critical mass together to convince the Spanish to open more albergues and guest houses as well as adding other infrastructure. 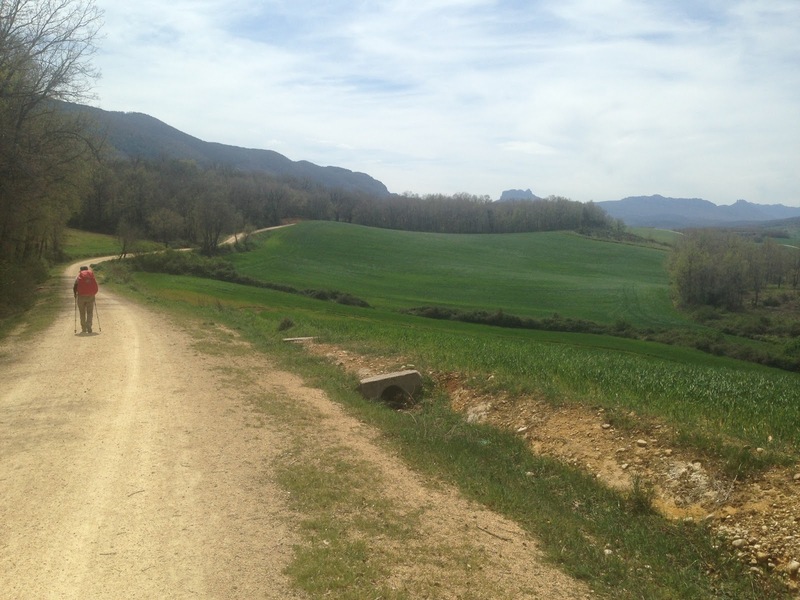 It is doable now though and if the rest is anything like we have seen so far, it will be a great Camino for everyone. Fun fact for the day: the word “Jesuit” was originally a term of derision and reproach by other Catholics and Protestants against members of the Society of Jesus. It was only as time went on that friends of the Jesuits and the Jesuits themselves took on the word as a term of endearment or respect and started using it themselves. I learned of an app called Translate that might be useful to you? Will scan signs etc as well to translate. Does vocal translation from Spanish-English/English-Spanish. Accuracy is not assured though as accents throughout country can vary!! I'll check it out. It may come in handy as I get away from the more well travelled areas. Loving every bit of your journey here! My feet are aching to be on the trail. Buen Camino!